Whitespire has a beautiful spire-like upright form, white non-exfoliating bark and excellent bronze birch borer resistance. Leaves are glossy, dark green turning yellowish-green in fall. 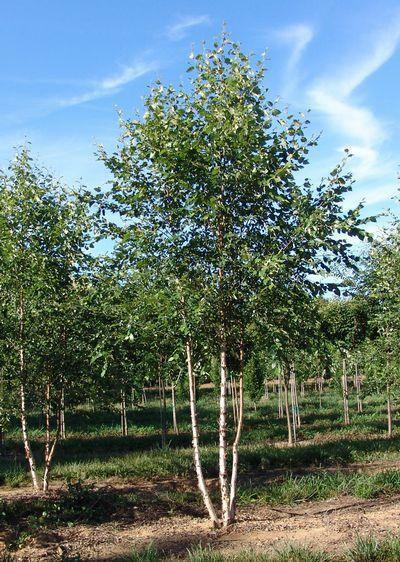 Whitespire Birch is very adaptable preferring moist, well drained, slightly acidic soils. Selected over twenty years ago by Dr. Edward R. Hasselkus at the University of Wisconsin, Madison Arboretum. Originally thought to be Betula platyphylla japonica, Whitespire has recently been identified as Betula populifolia, Gray Birch, a species known to be bronze birch borer resistant. Our plants are grown from seed collected from the original Whitespire Birch selection in an isolated seed block. This differs from Whitespire Senior which is vegetatively propagated from the original ‘Whitespire’ plant. Since ‘Whitespire’ has been identified as Gray Birch and a resistant species, we feel it is unnecessary to grow vegetatively. It has proven over time to be one of the most useful birch on difficult landscape sites.